SAVANNAH, Ga. (AP) — When word reached Camp Lawton that the enemy army of Gen. William T. Sherman was approaching, the prison camp’s Confederate officers rounded up their thousands of Union army POWs for a swift evacuation — leaving behind rings, buckles, coins and other keepsakes that would remain undisturbed for nearly 150 years. Archaeologists are still discovering unusual, and sometimes stunningly personal, artifacts a year after state officials revealed that a graduate student had pinpointed the location of the massive but short-lived Civil War camp in southeast Georgia. Discoveries made as recently as a few weeks ago were being displayed Thursday at the Statesboro campus of Georgia Southern University. 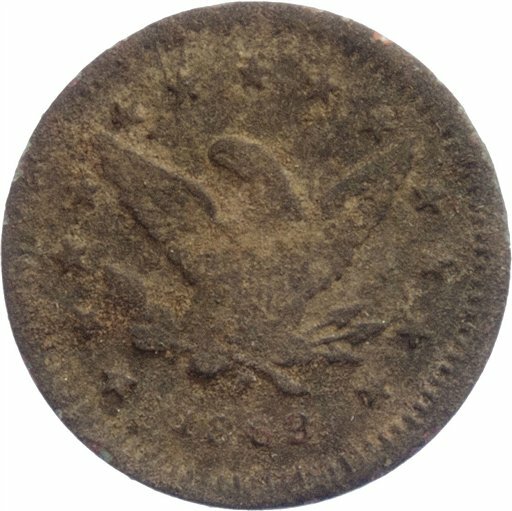 They include a soldier’s copper ring bearing the insignia of the Union army’s 3rd Corps, which fought bloody battles at Gettysburg and Manassas, and a payment token stamped with the still-legible name of a grocery store in Michigan. Camp Lawton’s obscurity helped it remain undisturbed all these years. Built about 50 miles south of Augusta, the Confederate camp imprisoned about 10,000 Union soldiers after it opened in October 1864 to replace the infamous Andersonville prison. But it lasted barely six weeks before Sherman’s army arrived and burned it during his march from Atlanta to Savannah. Barely a footnote in the war’s history, Camp Lawton was a low priority among scholars. Its exact location was never verified. While known to be near Magnolia Springs State Park, archaeologists figured the camp was too short-lived to yield real historical treasures. That changed last year when Georgia Southern archaeology student Kevin Chapman seized on an offer by the state Department of Natural Resources to pursue his master’s thesis by looking for evidence of Camp Lawton’s stockade walls on the park grounds. Chapman ended up stunning the pros, uncovering much more than the remains of the stockade’s 15-foot pine posts. On neighboring land owned by the U.S. Fish and Wildlife Service, he dug up remnants of the prisoners themselves — a corroded tourniquet buckle, a tobacco pipe with teeth marks in the stem and a folded frame that once held a daguerreotype. A year later, Chapman says he and fellow archaeology students working at Camp Lawton have still barely scratched the surface. In July, they used a metal detector to sweep two narrow strips about 240 yards long in the area where they believe prisoners lived. They found a diamond-shaped 3rd Corps badge that came from a Union soldier’s uniform. Nearby was the ring with the same insignia soldered onto it. The artifacts also yield clues to what parts of the country the POWs came from, including the token issued by a grocery store in Niles, Mich., that customers could use like cash to buy food. Stamped on its face was the merchant’s name: G.A. Colbey and Co. Wholesale Groceries and Bakery. Similarly, there’s a buckle that likely clasped a pair of suspenders bearing the name of Nanawanuck Manufacturing Company in Massachusetts. Hooks and buckles that appear to have come off a Union knapsack also hint that, despite harsh living conditions, captors probably allowed their Union prisoners to keep essentials like canteens and bedrolls. The Georgia Southern University Museum plans to add the new artifacts to its public collection from Camp Lawton in October along with a related acquisition — a letter written by one of the camp’s prisoners on Nov. 14, 1864, just eight days before Lawton was abandoned and prisoners were taken back to Andersonville and other POW camps. The letter written by Charles H. Knox of Schroon Lake, N.Y., a Union corporal in the 1st Connecticut Cavalry, was purchased from a Civil War collector in Tennessee. Unaware that Camp Lawton will soon be evacuated, Knox writes to his wife that he hopes to soon be freed in a prisoner exchange between the warring armies. He doesn’t write much about conditions at the prison camp, but rather worries about his family. He tells his wife that if she and their young son need money for food or clothing, there’s a man who owes him $9. Knox also gives his wife permission to sell the family’s cow. Brent Tharp, director of the campus museum, said his growing collection from Camp Lawton has definitely drawn Civil War buffs to visit from far beyond southeast Georgia. 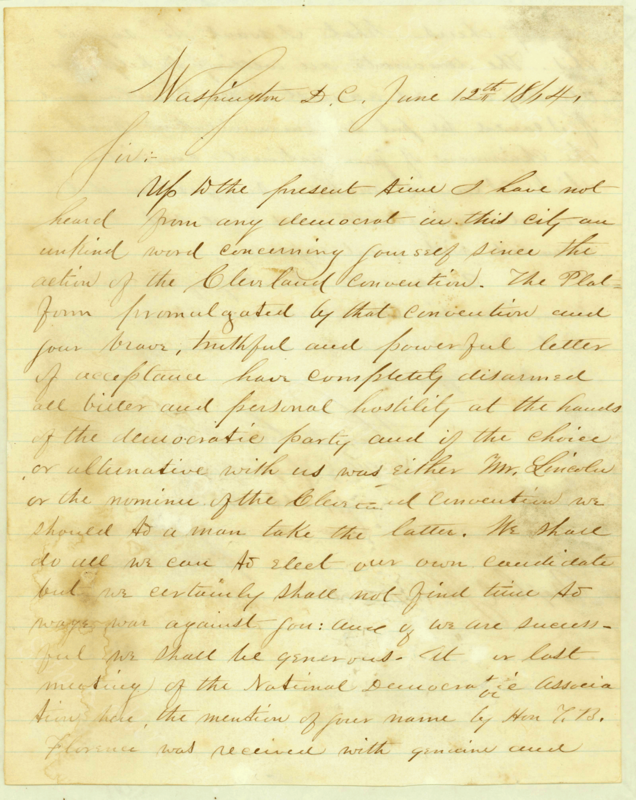 A rare 1864 letter by Frederick Aiken, the attorney who later represented Mary Surratt in her Lincoln Assassination conspiracy trial, is up for sale by Seth Kaller Historic Documents. Owning historic documents is not for the feint of heart – or budget. Frederick A. Aiken, former Secretary of the Democratic National Convention, applauds General John C. Frémont’s nomination by the Radical Republicans. He suggests that Frémont will have the blessing of the Democrats if he goes up against Lincoln for the Republican nomination. Aiken went on to serve (unsuccessfully) as defense attorney for Lincoln assassination conspirator Mary Surratt. “Washington D.C. June 12th 1864. Up to the present time I have not heard from any democrat in this city an unkind word concerning yourself since the action of the Cleveland Convention. 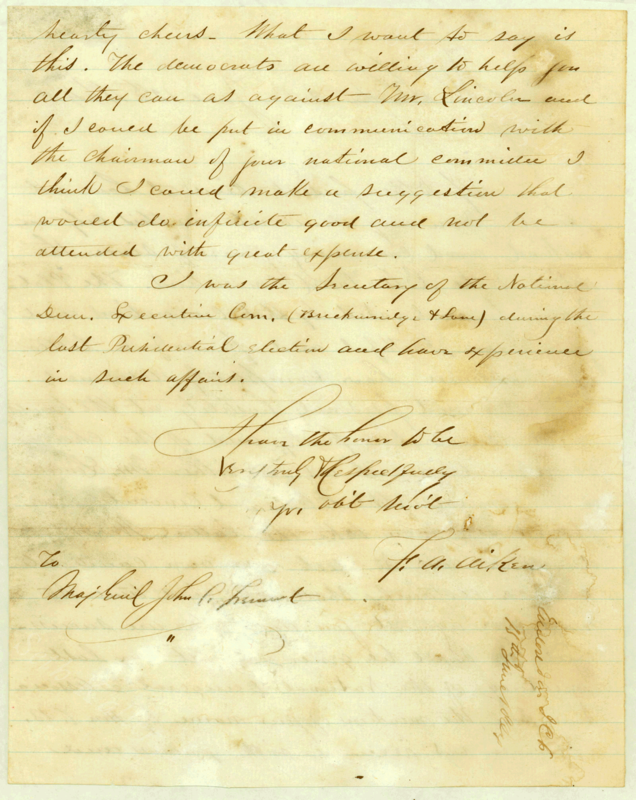 The Platform promulgated by that convention and your brave, truthful and powerful letter of acceptance have completely disarmed all bitter and personal hostility at the hands of the democratic party and if the choice or alternative with us was either Mr. Lincoln or the nominee of the Cleveland Convention we should to a man take the latter. We shall do all we can to elect our own candidate but we certainly shall not find time to wage war against you: and if we are successful we shall be generous. At [text loss] last meeting of the National Democratic Association here, the mention of your name by Hon. T.B. Florence was received with genuine and  hearty cheers. What I want to say is this. The democrats are willing to help you all they can as against Mr. Lincoln and if I could be put in communication with the chairman of your national committee I think I could make a suggestion that would do infinite good and not be attended with great expense. I was the Secretary of the National Dem. Executive Com. (Breckenridge & Lane) during the last Presidential election and have experience in such affairs. Lincoln and his advisors were not overly concerned about the third party. Army Chief of Staff Henry Halleck called the Cleveland meeting the“Ragtail convention,” and professed that Frémont merely wanted to be bought off. If the aim of the organizers of the Cleveland Convention was to influence the mainline of the Republican Party, then they failed. The Republicans met in Baltimore on June 7 and 8, and renominated Lincoln, replacing Hannibal Hamlin on the ticket with Tennessee Unionist Andrew Johnson. In this letter, Democrat F.A. Aiken (1810-1878), a high-ranking advisor in John C. Breckenridge’s 1860 presidential campaign, suggests to Frémont a clandestine collaboration with the Democrats to defeat Lincoln. It was one of the few times in American history that a sitting wartime president stood for reelection, and Lincoln faced considerable opposition. The war was not going well in the late spring of 1864. Nine days earlier, the Battle of Cold Harbor – Grant’s worst setback in the Overland Campaign – had reached its bloody conclusion. In his southward march on Richmond, Grant acquired a reputation of callousness in the face of mounting casualties (already 60,000 in the month-long campaign). If Frémont, who was very popular with German-Americans in New York and the Midwest, could manage to divide the Republican electorate, he could throw the election to the Democratic candidate. Early in the war, Lincoln had removed Frémont from military command in Missouri because he had unilaterally declared martial law in the state and threatened to confiscate the property, including slaves, of Southern sympathizers. Lincoln gave Frémont command of an army in western Virginia, where he was defeated by Stonewall Jackson in the Battle of Cross Keys. Frémont refused to serve under General John Pope in the subsequent army reorganization, and Lincoln never again gave him a field command, contributing to the Pathfinder’s personal grudge. The Democratic Party did not hold its convention until the end of August. With the campaigns against Richmond and Atlanta still stalled, the Democrats nominated another discarded general with a loyal following – George B. McClellan – to run against Lincoln. Efforts to broker a deal between McClellan and Frémont were unsuccessful – the two had little in common except their hatred of Lincoln. On September 2, William Tecumseh Sherman finally defeated John Bell Hood and occupied Atlanta. This event, coupled with Philip Sheridan’s subsequent successes in the Shenandoah Valley, helped ease voters’ concerns about the war, and propelled Lincoln to a convincing reelection victory in November. Frémont abandoned his political campaign on September 22, 1864, after agreeing to a deal in which Lincoln removed Frémont’s enemy, U.S. Postmaster General Montgomery Blair, from office. John C. Frémont (1813-1890), “the Pathfinder,” was a legendary explorer who achieved military victories in California during the Mexican War. He entered politics as California’s first senator and then became the first Republican presidential candidate in 1856. Frémont was a controversial political general during the Civil War, commanding the Western Department from St. Louis in 1861, and West Virginia in the first half of 1862, before being pushed out of service.